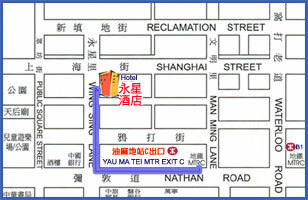 Wing Sing Hotel is located in the centre of Kowloon. It is situated in one of the most colourful and vibrant areas of the lively and cosmopolitan city. Along with the “Golden Mile” nearby, Yaumatei is a famous business, shopping and entertainment district. Furthermore, there are many famous tour spots around, tourists can realize the local culture of Hong Kong, such as Temple Street and Jade Market, etc. Moreover, many large-scale shopping malls and restaurants are close-by, it is really an attractive accommodation whatever for business or traveling in Hong Kong. The Security System is well equipped in our hotel which the security guard is 24-hours on duty. Grand Palace Hotel provides four types of room for different guests, eg. Standard Single Room, Standard Twin Room, Superior Triple Room and Luxury Family Room which maximum capacity are 4 - 5 persons, suitable for the whole family members. Wing Sing Hotel is well served by different kinds of public transportation. It is very convenience for getting to the Hong Kong International Airport, Macau or Mainland. In the meantime, you just take a few minutes walk away to get the MTR subway system and as well as Kowloon-Canton Railway which connects to China. Guests can make the reservation via internet, e-mail, fax or telephone, the details are shown below.